"Discover The Simple Techniques That Will Bring Dirt Cheap and Even 100 Free Traffic To Your Website Within Minutes That Can Have You Profit in Less Than 24 Hours 100 Guaranteed!" You have purchased ebook after ebook after ebook. They all promise a great money making "system". But when you try to apply the system, it's really more complicated than it sounded - and it only appears to work for "others." Granted, you will not become a millionaire by using these tactics. But, if you want to make an extra $1,000, $3,000, $5000 or more per month in a safe way, then this guide is for you. * How to start when you have almost no money: bankrupt, broke and on the run. Right now, you may be having financial difficulties. I will give you some smart ideas to get out of this unpleasant situation (without robbing a bank). 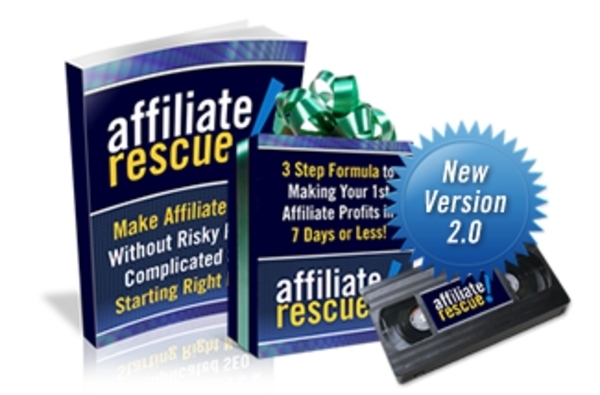 * How to find affiliate programs to promote. You will discover the easiest ways to find affiliate programs worth promoting - as well as some little-known products that pay well but not many people promote. * Email marketing and how to create killer follow up messages that make you money on autopilot. You may have read entire "bibles" on email marketing. I will give you in a couple of pages what you really need to keep in mind. Do this, do that. * How to tap into the online service "Yahoo Answers" to gain market intelligence and tap into people who are ready to buy your product. Almost everyone is "working the system" the wrong way! I'll show you how it's really done. * How to get on the first page of the search engines for the best possible terms. And no, this has got nothing to do with "long tail" keywords or building "content sites". We are lazy so we'll take a shortcut that results in less work and more money! (now that's my kinda system :-). What I really like about Affiliate Rescue is that it takes care of both the newbies as well as seasoned affiliate marketers. If youï¿½re a newbie, you can use the techniques immediately.